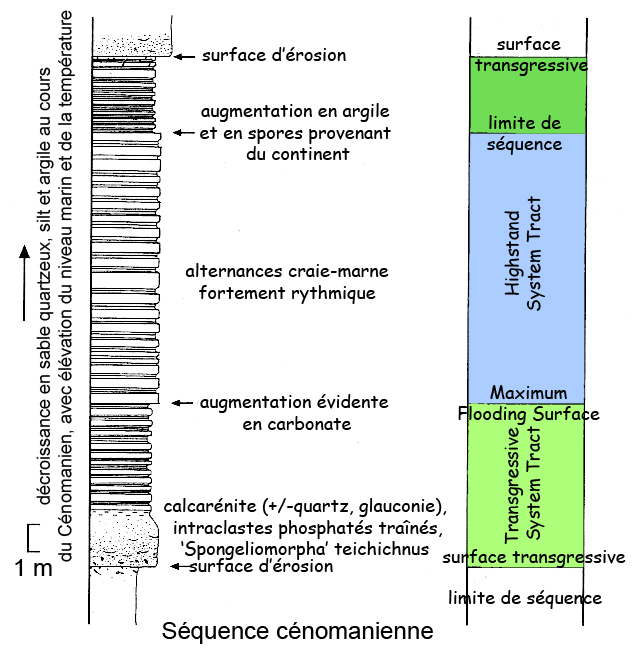 In a pond, the sedimentary series get organized in a logical succession of sequences under the control of the space of accommodation, that is the thickness of the slice of water between the bottom and the surface of the water (or relative depth). The potential of accommodation (or accommodation) is the speed of creation of space of accommodation, thus the first by-product according to the time. 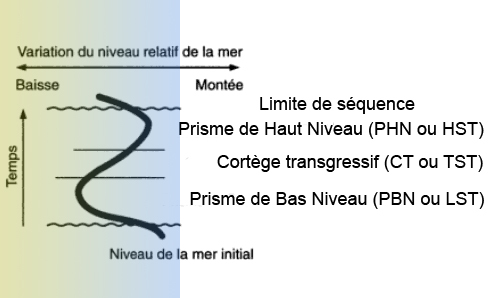 The eustatisme (variation of the marine level with regard to a fixed datum). The third factor, the eustatisme, is generally the main factor. A high-level prism (Highstand Systems Tract or HST). The base of sequence (Sequence Boundary or SB) between HST and LST. The transgressive surface (Transgressive Surface or TS) between LST and TST. 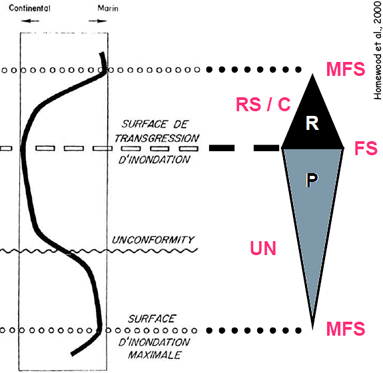 The surface of maximal flood (Maximum Flooding Surface or MFS) between TST and HST. What are the sedimentary reactions to a variation of the space of accommodation? Fossils are kept in large number. Ferruginous surfaces and nodules of pyrite. Section going from Bracquemont to Diepp e, Eric Lasseur's sequential interpretation. Section going from Fécamp to Saint-Martin-aux-Buneaux, interpretation E. Lasseur. Section going from Saint Jouin to the Lime tree, the interpretation E. Lasseur. Section going from Fécamp to the Cap d' Ailly, the interpretation E. Lasseur. Section going from Penly to Dieppe, interpretation E. Lasseur. Summary of sequences distinguished by E. Lasseur, from Cénomanien to Campanien. -The base of the zone in Uintacrinus socialis (Upper Santonien).